THE SOUL EXCHANGE is a band put together by main songwriter and Guitarist Hans Von Bell who after releasing a two year in-the-making solo album in 2015, decided to gather a full band of musicians for the follow up, and name the band after a song from his solo album. The band has since been very busy writing material and after their first critically acclaimed album "Bloodbound" in 2017, they have also put together a 5-track EP "Vow Of Seth" to tease their "New and Darker" sound before the release of the next full album due for 2018. I haven't heard the works of THE SOUL EXCHANGE before so I am unfamiliar with their original sound, but I am very much a huge fan of the dark music displayed on this EP! The riffs are kept fairly simple and withdrawn (despite catchy with a lot of memorability!) which gives a lot of room for the excellent vocal talents of Daniel John, hitting a lot of intense and impactful scale patterns with his ambiguously haunting and delicate voice. 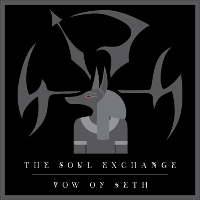 The first song and title track "Vow Of Seth" opens up with a very eerie synth and Sitar piece, which works really well with the eye-catching artwork of Anubis - The Ancient Egyptian god of the dead, and leads into a very slow and heavy guitar riff. This is a great song to open up the album with, a lot of intensity in the verse with a dark and infectious chorus. "Back To The Dark" is another dark and heavy song which kicks off with a BLACK SABBATH like riff with a church organ playing alongside it which gives me strong vibes of GHOST B.C, before bringing things right back down again with dissonant keys and guitar notes, with a deep and chilling spoken voice before bringing back the heavy riffing. This is a very dynamic track and again gives the vocals a lot of opportunity and Daniel takes full advantage of that opportunity all over this song! "The Deed is Done" is yet again another slow and chilling song but what I love is that this sound doesn't get stale! Despite being very held back and airy, this particular track has more of a melancholic vibe to it and has the best chorus and vocal performance of the album. After hearing the melodies displayed here, it is clear that Daniel has one of the best voices in dark Heavy Metal, hitting low and high notes with precision and passion! This EP closes with "My Mortal Soul" which is centered mostly around Piano and Orchestration with a very emotional vocal delivery, a very deep song which you can easily find yourself slipping away into your own world listening to, a powerful and content ending to such a unique and dark EP and I felt very satisfied as the last chord faded away into silence. I really enjoyed this EP, It was nice to sink back into something dark and heavy, with a lot of emotion and expression in the lyrics and musical dynamics. My one concern is that while this is a great 5-track EP, keeping this same style throughout the duration of a full album may start to get tedious, so my one comment on that would to maybe throw in a couple of faster tracks on a full 8 or 10 track album for even more of a dynamic shift. But having said that, this EP was mostly a showcase of a new sound and to tease fans as to what kind of direction the next album will take the band, and I am looking forward to seeing where 2018 will take THE SOUL EXCHANGE.